Thanks, everyone, for all your hard work on another successful rodeo and for Rodeo Chair Ray Wright’s coordination and leadership with this year’s event! What a great weekend. Laura Hill says our gate count Friday was 2,306. On Saturday, it was 783. Saturday wasn’t bad considering the weather reports during the day. We were blessed to largely escape damage in our area and that the rain quit earlier than expected. 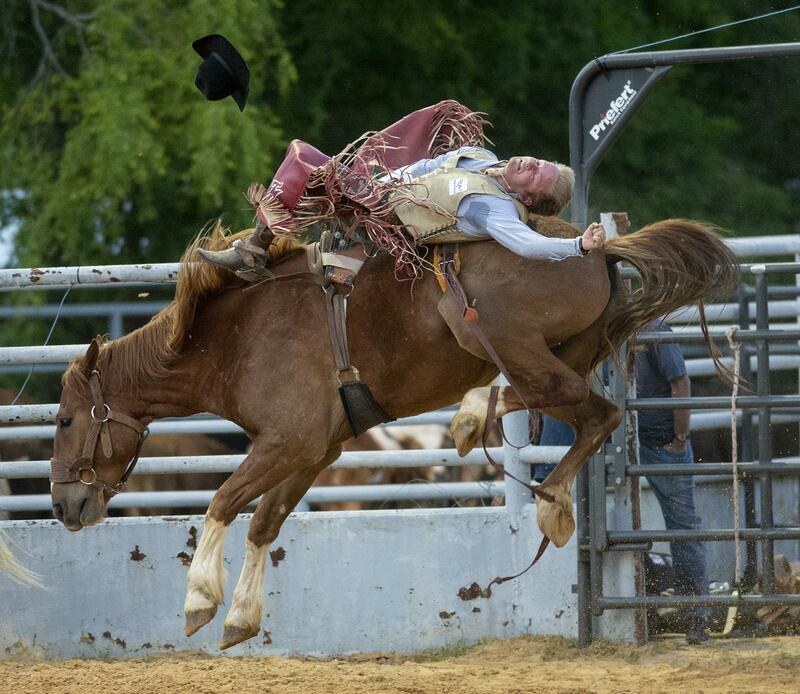 Remember, if you helped us put out signs for the Rodeo, those need to be picked up soon and returned to Tyler Rainer. We do not have a meeting this week. Tyler said you can hold onto them and give them to him when we next meet at the Hilton (April 26) or take them by his office on Airline near Loop 281. We do have a board meeting at noon Monday at Development Services, if you'd like to attend. If I don’t see you before next week, I hope you and yours have a great Good Friday and a Happy Easter. Keith McIntosh gave us a program last week with something to think about when it comes to heart health. It’s an important issue and was a handy way to get to know a little bit more about Keith. Thanks for doing that. Rodeo time is almost here! If you have signs to put out, be sure you’re getting them up. Please also take some posters and help distribute those. Don’t forget about the tickets that are your responsibility. We need to help get the word out as much as we can to be sure those stands are filled! We shared the 2019 commercial spot on the club’s Facebook today. Please also share that on your own pages. There is a rodeo meeting at noon tomorrow (Wednesday) in the VIP area of the arena. This Friday, the club will meet at the Hilton. The following Friday (April 12), we’ll have our meeting at the Rodeo Arena. April 6: Rotary District 5830 Training Assembly in Mount Pleasant. There’s still time to register. April 12: Noon club meeting will be at the Rodeo Arena. April 19: No meeting, enjoy your Good Friday. April 27: Street cleanup. Meet at 8 a.m. at Pine Tree High School parking lot off Fairmont. This Friday, it is Michael Shirley’s week to bring the prize for Rusty’s Raffle, and it’s Michael Liverman week to get us lined out for the song, Pledge, prayer and 4-Way Test. Our program will be a man who needs no introduction, our own John Jetter. 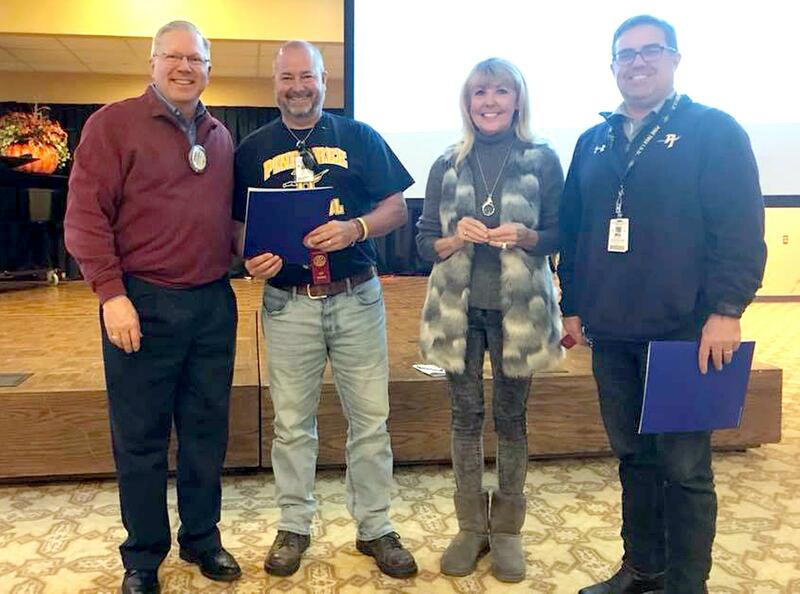 Thanks again to Randy Harris for putting together a very nice program for last week's meeting that helped — I think all of us — learn a little bit more about Rotary and in a way that was fun. Ray said it with all kinds of enthusiasm last week: WHAT TIME IS IT? It’s Rodeo time, and we have just more than two weeks before it opens on Friday, April 12. It’ll be here before we know it. There's been a ton of work happening up to this point, and there will continue to be before it gets here. But it will get here, we'll be ready, and we've all been praying for good weather! The next Rodeo meeting will be at noon Wednesday at the Rodeo Arena in the VIP area. 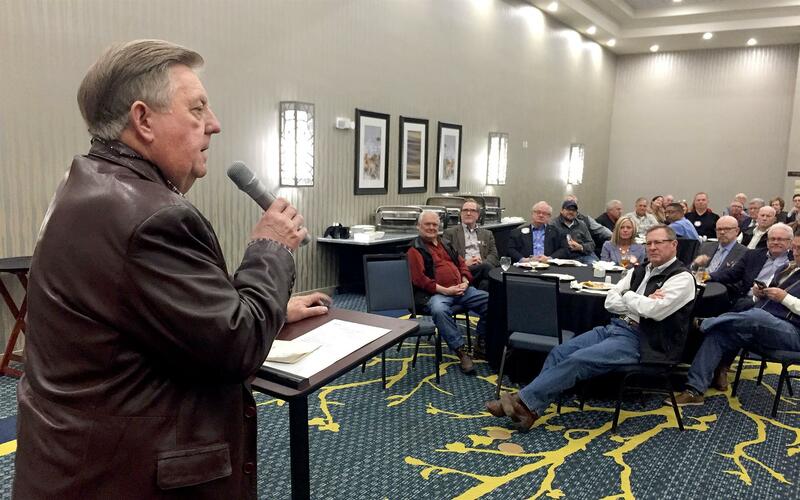 Rodeo Chair Ray Wright says there are still 25 Rotarians who have not picked up their tickets for the rodeo or bought a business or sponsorship package. We need 100 percent participation to make the rodeo as successful as possible, and business and sponsorship packages must be finalized by Friday to make it into the program. April 6: Rotary District 5830 Training Assembly in Mount Pleasant. There’s still plenty of time to register. April 12: Noon meeting will be at the Rodeo Arena. This Friday, it is Roger Sage Jr.’s week to bring the prize for Rusty’s Raffle, and it’s Mike Lewis’ week to get us lined out for the song, Pledge, prayer and 4-Way Test. Our program will be Keith McIntosh, who has visited the club a couple of times as a guest of Dave Wright. 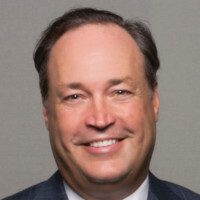 McIntosh is the Executive Cardiology Services Director at Christus Good Shepherd Health System. If you have signed up to help put out yard signs, Tyler Rainer will have them at the meeting Friday. Please get them there or arrange to pick them up from his office. I hope you’ve been enjoying the pleasant weather this week. I’ll keep it short(er) in this email. First, a note about lunch. Since we’ve been at the Hilton, we’ve run out of meat a couple of times. Because of that, we had one meeting where the staff was serving meat. They don’t want to do that and we’d rather they not, but that means we’ll have to be mindful of the portions of meat we’re taking. That’s how they base how many people to prepare for. The rodeo is quickly approaching. As Gene recently stated in an email, selling or buying business packages is one way to help attendance. You should have also received your tickets. If not, see Ray Wright. If you have rodeo signs, Tyler Rainer will be collecting those at his office. It’s the Edward Jones office on Airline by Loop 281. It is Charles Rader’s week to bring the prize for Rusty’s Raffle, and it’s Randall Latch’s week to get us lined out for the song, Pledge, prayer and 4-Way Test. We’ll have a double-barreled program today with a short rodeo update from Chair Ray Wright and Past Chair and President-Elect Karen Maines. Then, Randy Harris is going to have some fun with a little Rotary trivia as we also take a look at the importance of Rotary. I hope everyone made it through the storms alright. I want to remind everyone that we are NOT meeting this week. I mentioned during the meeting last week that we’d gotten an email from Hollie Bruce at Newgate Mission about the work done with funds raised during our concert this past fall. "With funds from Greggton Rotary, Newgate Mission has been able to resurface the parking lot. The City removed the curb which was so close to our building that it was difficult to park. This also created a drainage issue, which the City promptly took care of. The City and JR Welborn worked together to make the transition from street to parking seemless, and in doing so have enhanced safety. We are so thankful to Greggton Rotary for making this possible!" Remember, the Rodeo is April 12 and 13. If you don’t yet have a place where you’ll be working during the rodeo, please see Ray Wright. There are Rodeo meetings each Wednesday at noon at East Texas Builders Association. Everyone, have a great week. I will see you at the meeting on the 22nd. 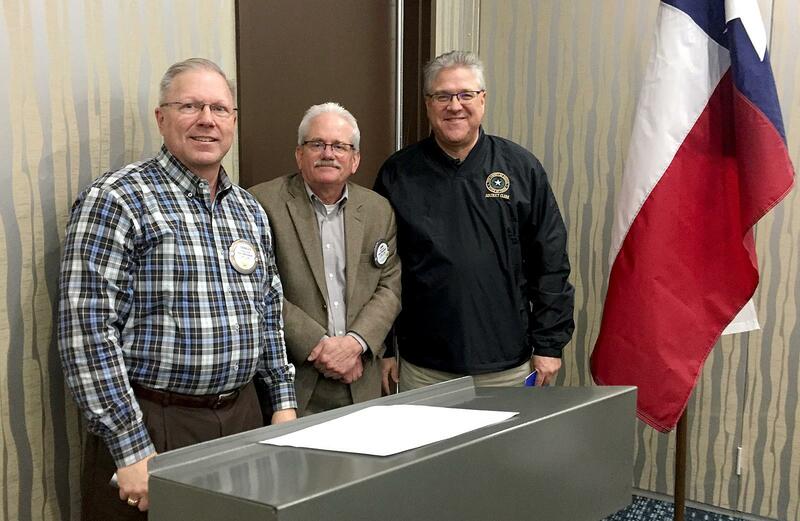 Thanks to club members and Pine Tree ISD Superintendent Steve Clugston and Assistant Superintendent Dr. Eric Cederstrom for sharing with us last week some of their vision for the next five years of the district. There was a lot of passion for the school district, it’s staff and students in the program. Remember, the Rodeo is April 12 and 13. If you don’t yet have a place where you’ll be working during the rodeo, please see Ray Wright. There are Rodeo meetings each Wednesday at noon at East Texas Builders Association. Tickets will be distributed to members soon, and be on the lookout for other announcements. This week, we’ll hear from Natalie O’Rourke and Jennifer T. Jackson with the Texas Oncology Foundation. You’ll probably remember, they were the recipient of funds raised at this past year’s Chicks ‘N Chaps. We’ll also hear from Karen Maines about the trip she and Donna Sharp made this past weekend to the President-Elect Training Seminar in Dallas. It is Shirley Qualls’ week to bring the prize for Rusty’s Raffle, and Jack Jenkins will get us lined out for the song, pledge, prayer and 4-Way Test. 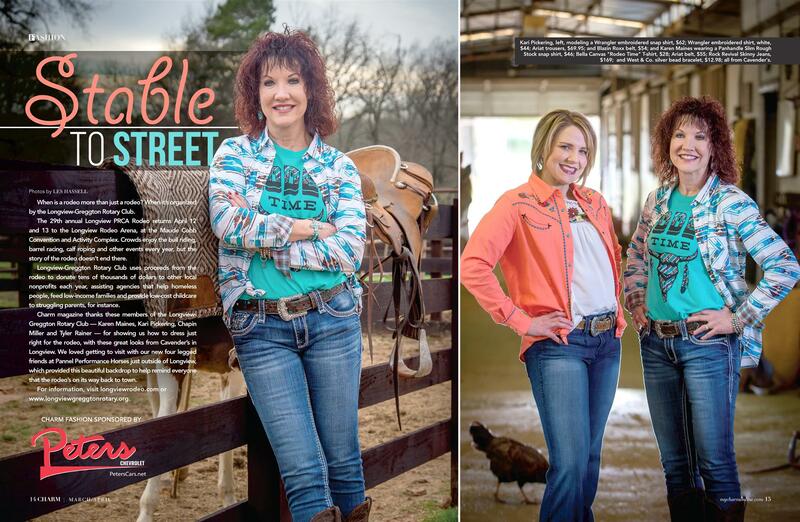 If you haven’t seen the most recent issue of Charm/View, the fashion spread in this edition features four of our club members along with information about the rodeo. 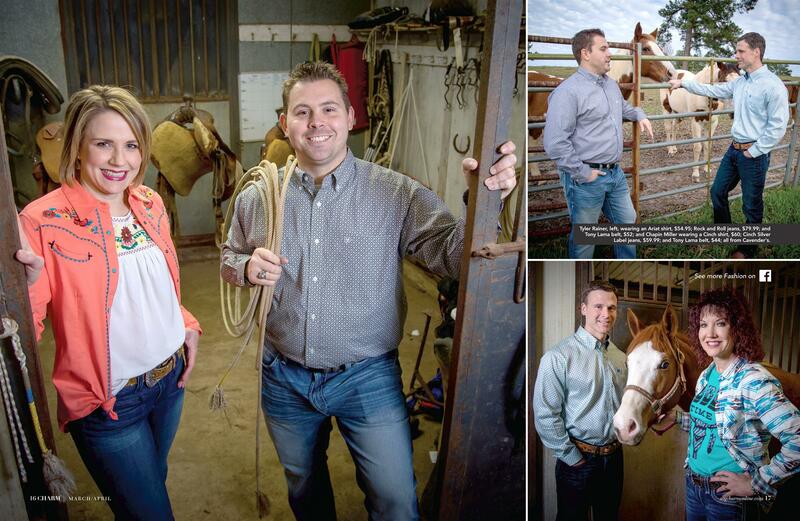 Not to plug my employer, but Karen Maines, Chapin Miller, Kari Pickering and Tyler Rainer do look pretty sharp in the spread. It’s nice to get to spread the word about the rodeo, too. 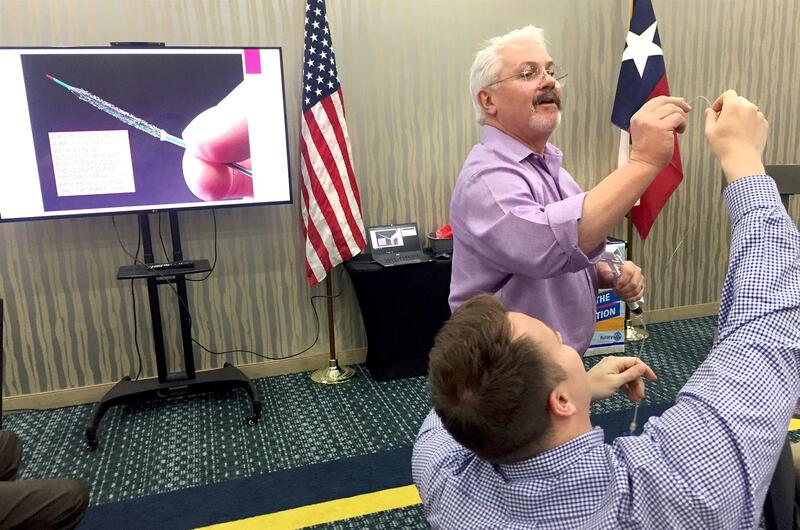 Karen and Donna Sharp are headed to PETS (President Elect Training Seminar) in Dallas today for the weekend. They will surely come back energized about Rotary and full of ideas for the club. It'll be good to hear about that experience. We’ve been trying to get some host families for a 14-year-old German girl in the Rotary Youth Exchange, but we’ve come up short. The Gilmer club has two families ready to go and a third that is interested. They are going to take that exchange student this time around. I’m hopeful our club can make it work again in the future. Remember, the Rodeo is April 12 and 13. If you don’t yet have a place where you’ll be working during the rodeo, please see Ray Wright. It is Steve Pirtle’s week to bring the prize for Rusty’s Raffle, and it’s David Hayes’ week to get us lined out for the song, Pledge, prayer and 4-Way Test. This week, we’ll hear from Steve Clugston, club member and superintendent of Pine Tree ISD. Enjoy this sunshine while it lasts. We had a pretty weak showing at this past weekend’s street cleanup. Thanks to those who did make it. The weather was cool, but it wasn’t as cold as the previous time. Tyler Rainer, Colt Edwards, Chapin Miller, Dave Wright and Steve Pirtle were there. Thanks, y’all. It was very nice to have four of our Interact members there to help. Let’s see if we can get more Rotarians next time. Remember the District 5830 Foundation Dinner is Saturday in Texarkana. If you haven’t signed up, there’s still time. Longview Regional has offered the club a complimentary table at their Dine with Docs event next week. It’s Tuesday, Feb. 26, from 5:30 p.m. to 7 p.m. This isn’t a lot of notice. If you are interested, let me know by 8 a.m. Friday. They are tables of 10. If we get enough to fill most of it, we’ll take it. If not, we’ll pass. 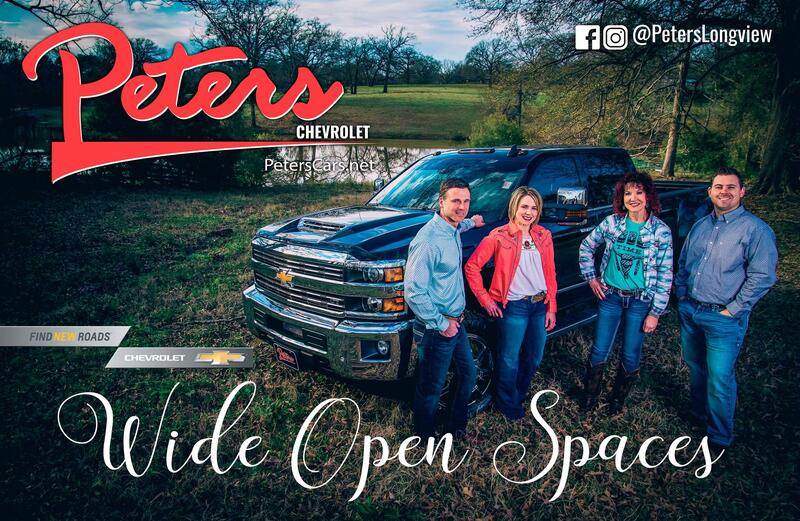 It is Kari Pickering’s week to bring the prize for Rusty’s Raffle, and it’s Trey Hattaway’s week to get us lined out for the song, Pledge, prayer and 4-Way Test. Our program this week is Kelly Hall, President/CEO of the Longview Chamber of Commerce. 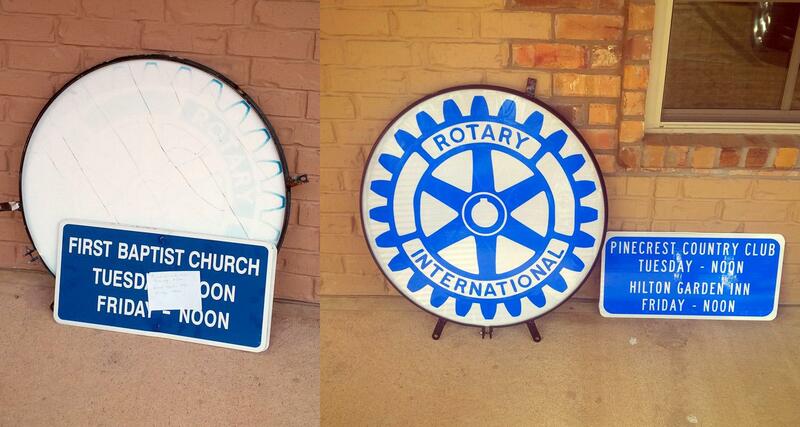 If you pass by Bill Owens and Loop 281, you might notice how nice the Rotary International sign looks there. John Green sent these photos. He says Keith Bonds had the sign taken down and that an anonymous friend of Rotary paid to have it refaced, so it could be replaced looking bright and new. It also has the updated meeting locations for our club and the downtown club. Here’s a look at the signs before and after. And here’s a look at what the sign looks like hanging back in place. Thanks, John, Keith and the unnamed friend of Rotary. There are others that need similar attention, but it's great to see this one looking so sharp. Don’t forget, we have our street cleanup this Saturday. We’ll meet at 8 a.m. at the Pine Tree High School parking lot off Fairmont Street. We’re expecting to be joined by some of our Interact Club members. Saturday, April 6: Districdt 5830 Training Assembly. This is usually the same weekend as the Rodeo. It’s not this year, so let me know if you are interested in going. 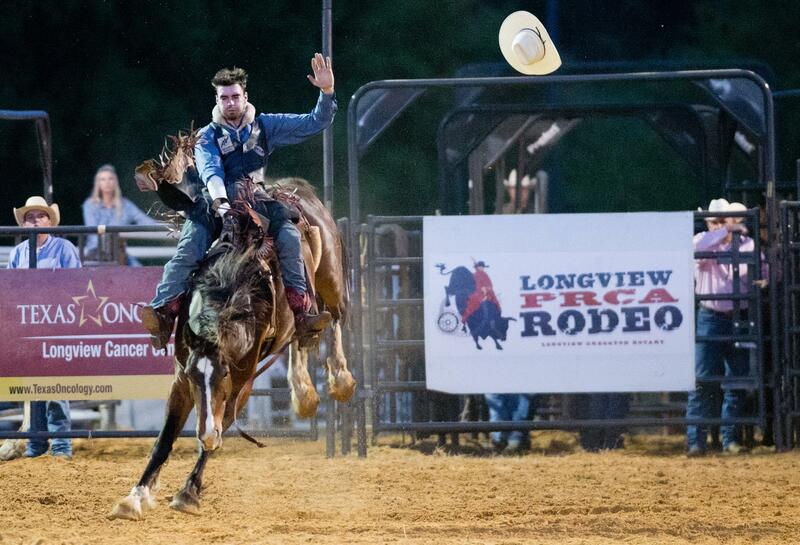 April 12, 13: Longview PRCA Rodeo. You better already have this one on your calendar. Great to see he’s doing well, and thanks to Donna for the updates. We're still looking for possible Rotary Youth Exchange host families. If you know someone who might be a good candidate, please let me know. It is Judge Phillips’ week to bring the prize or Rusty’s Raffle. It was to be Merritt Grimm’s week to get us lined out for the song, Pledge, prayer and 4-Way Test, but he can’t make it this week. So, I’ll be looking for volunteers. This week, we’ll hear from Karen Maines and others about how the trip with her, Donna Koerner and Tommy Warren went with six RYLA campers this past weekend. They had a cold weekend to be at RYLA! Enjoy these warm temperatures while they last. It’s about to cool off again. I hope everyone is having a good week. 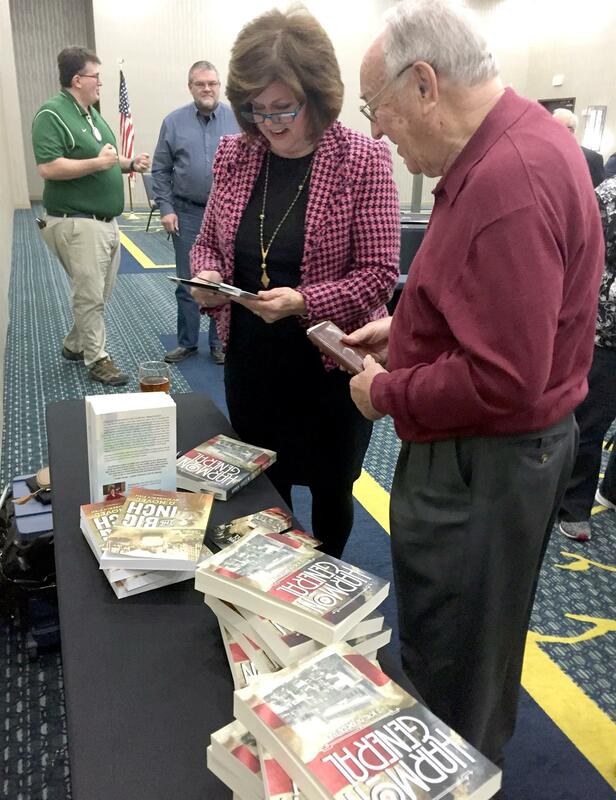 Thanks to Kimberly Fish for again sharing her knowledge of the unique history of East Texas she writes about in her new book, "Harmon General." Good luck to our club members headed Friday to RYLA camp. Karen Maines, Donna Koerner and Tommy Warren will have some great stories to share after the weekend, a always. 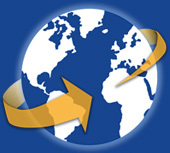 Go to https://my.rotary.org/en/donate. Follow the very easy steps. One of the first things it asks is if it's a memorial donation. You can log in if you want points for your donation or finish as a guest. Ingrid says she sent her notification to Jim and Mary Jo Roberts, 1805 Northwest Drive, Longview, 75604. We are still looking for host families for a Rotary Youth Exchange student from Germany. If you know someone who might be interested, please let me know. I’ll help you convince them! 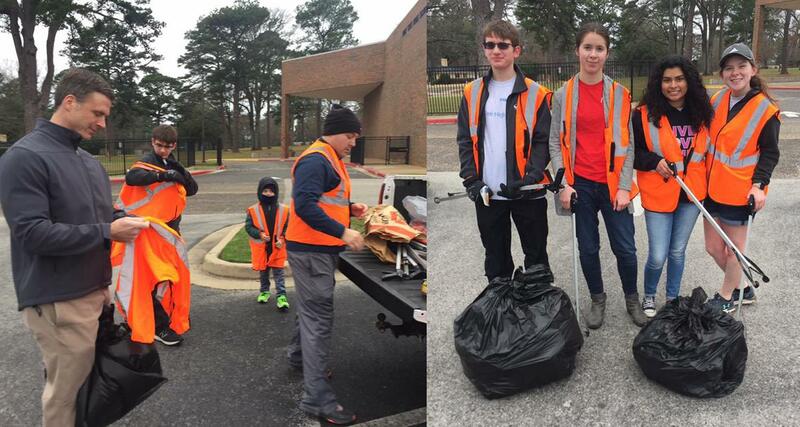 Don’t forget: We have our next street cleanup on Saturday, Feb. 16, which is coming up soon. Please plan to be there if you can. We'll meet at 8 a.m. at the Pine Tree High School parking lot off Fairmont. Also, the District 5830 Foundation Dinner is Saturday, Feb. 23 in Texarkana. You can register on the district website here. It is Kevin Palmer’s week to provide the prize for Rusty’s Raffle, and John Green this week will get us lined out on the song, Pledge, prayer and 4-Way Test. This week, our program will be Jennifer Martin from the Shriner’s Hospital of Shreveport. I hope everyone enjoyed getting to hear from Rusty’s son last week. He shared some stories that were new to me, and I really enjoyed it. I also was grateful to have Eric Burger and Hollie Bruce present to talk about their plans for funds raised at the Amy Grant concert and donated to those organizations, along with Bob Metzler and the Arboretum's plans for the sponsorship money they helped raise. Our next street cleanup will be in the next couple of weeks. We had planned for Feb. 23, but Tyler Rainer, who has moved into the Service Chair position tells me Interact would like to help. He says Feb. 16 works better for them. We'll get that nailed down and let everyone know. Tyler moves into the spot vacated by Colt Edwards who has taken over Wayne Tramel's position of Fundraising/Allocations Chair. Wayne has taken a leave of absence due to changes at work. The next Rodeo meeting is at noon Feb. 6 at East Texas Builders Association. The District Foundation Dinner is Saturday, Feb. 23, in Texarkana. It is Troy Murrain’s week to bring the prize for Rusty’s Raffle, and it’s Ralph Emerson’s week to get us lined out for the song, Pledge, prayer and 4-Way Test. He told me he likely won’t make it, so be ready to be volunteered! At the meeting, Foundation Director David Yowell will talk about what you need to do if you'd like to donate to the Foundation in memory of Rusty Roberts. Our program this week is author Kimberly Fish, who will be talking about her book, "Harmon General." We are back at the Hilton Garden Inn this week for our meeting. We will be in a different room, though. This time, we’ll be in Oakmont A. It’s the room at the back from where you walk in on that side entrance. In case you missed the last meeting, we inducted new member Trey Hattaway. Trey was proposed by John Green, and Charles Rader did his induction. If you see Trey with his red badge, please make him feel welcome. If you still haven’t paid your dues for this six months, please get that done quickly. It is Vince Dulweber’s week to lead us in the song, Pledge, prayer and 4-Way Test. If he gets held up in court, I’ll be asking for help on this one. It is April Moore’s week to provide the prize for Rusty’s Raffle. This week, we will hear from our recipients of funds raised during our Concert this past fall. We will also get a visit by Rusty’s Roberts’ son, Jim, who has offered to come by and talk about the club and how much it meant to his Dad. Here’s a quick update to remind everyone that we are not meeting this week. I’ll see you all next week when we’ll hear from club member and Superintendent Steve Clugston about Pine Tree ISD. Thanks to those who were able to help at the Beds of Hope Build Day this past Saturday. We had fun building some beds, and Colt did not hurt anyone with that drill. 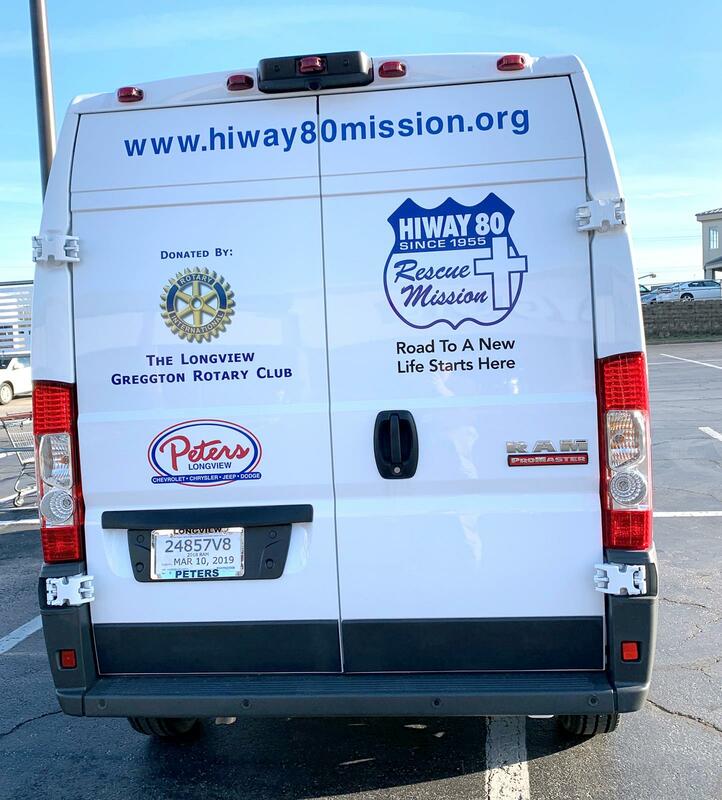 Thanks to Wayne Tramel for sending along this photo of Hiway 80 Rescue Mission's new van paid for with funds raised at our concert fundraiser. 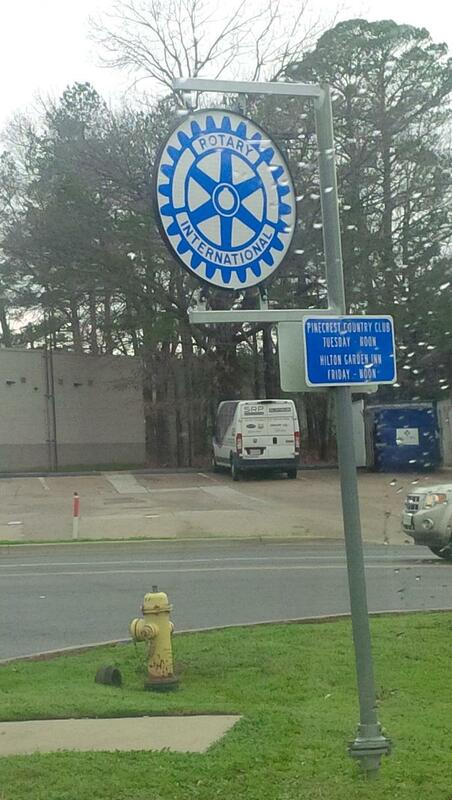 That makes another vehicle traveling around Longview with the Rotary gear and our club's name on it. We're still finalizing details of how Newgate Mission will use concert funds. Remember, services for Mr. Rusty are planned for Monday. Funeral services for Rusty Roberts will be at 2 p.m. Monday, January 21, 2018, in the Chapel of Rader Funeral Home with visitation with family starting at 1 p.m. Burial will follow at Grace Hill Cemetery. Thanks to everyone who made it to the meeting this past week, and that is most of you. We had excellent attendance for our first official meeting at the Hilton Garden Inn. We do have some adjustments to be made. I had a couple of people offer suggestions after the meeting, and I sure appreciate them. We’ll be making some changes for this week. If you see a way we can best utilize the space to our needs, please keep the suggestions coming. Laura Hill tells me we had 47 people eat at last week’s meeting. That is probably the largest number we’ve had since our meeting last April at the Rodeo Arena. That’s exciting. Remember, we have a service opportunity coming this Saturday. Beds of Hope is having a Build Day Saturday. It’s scheduled from 8 a.m. to 1 p.m., but the group is consider a later start due to expected rain that morning. I’ll keep you updated as I see information. Colt Edwards plans to be there. I plan to be there. Do you plan to be there? I hope several others of you do. Let Colt or I know. It’s at 692 Sunnybrook Drive. We had a Rodeo meeting today at East Texas Builders. The next one is set for noon Wednesday, Jan. 23, at the same location. If you can make it, please plan to be there. That is especially so if you are in charge of one of the areas. It is Vince Dulweber’s week to lead us in the song, Pledge, prayer and 4-Way Test. If he gets held up in court, I’ll be asking for help on this one. It is Chapin Miller’s week to provide the prize for Rusty’s Raffle. Our program this week is Judge T. Sheldon Parker. Phillip P. says he is a retired Oklahoma state judge and retired general. He was a Court of Indian Appeals Judge who joined the Oklahoma Guard after his service in Vietnam. It promises to be an interesting program. I’ll see you there. I hope everyone has a great and blessed year. Remember, this week is our first meeting at the new venue – Hilton Garden Inn. They say they’re ready for us on Friday. There is a Beds of Hope Build Day scheduled for Saturday, Jan. 12. We’d like to get a group of our Rotarians to help with the build day. Beds of Hope has been a recipient of Rodeo funds. If you can help, please see Colt Edwards or me. It is Jay Dean’s week to lead us in the song, Pledge, prayer and 4-Way Test, and Michael Liverman will supply the prize for Rusty’s Raffle this week. Our program this week was scheduled to be Richard Manley, but he’s been called out of town for a family emergency. Randy Harris and I are working on coming up with a backup. If you have ideas for a late-breaking program, please let one of us know. The menu at Hilton Garden Inn will be chef’s choice, similar to how it was when we had our test meeting. Remember we will not meet this week or next. Enjoy your break as you spend time with family and friends. If I don’t see you, Merry Christmas and Happy New Year! Thanks again to Michael and Julia Tubb for offering their lovely home as a venue for our Christmas party. It was a great time. You can find a few photos taken at the party by President-Elect Karen Maines by clicking here. It’s been a challenging and rewarding first half of the Rotary year for me. With help from all of you, we’ve made it this far and helped our community considerably along the way, and we continue to do so. Thanks for all you do. This club and this city are better because of you. Remember, we will not have a club meeting this week in light of our Christmas party tomorrow at the home of Michael and Julia Tubb. Thanks so much to the Tubbs for offering up their home for our party, and for Donna Koerner for her work on the party! As Gene wrote in an email a couple of days ago, great work to everyone in the club who has donated to The Rotary Foundation. Reaching $400,000 in total donations to TRF since the club’s beginning is quite a milestone. Don’t stop now. Stay dry today, and I hope to see most of you tomorrow at the Christmas party for some fun and fellowship. 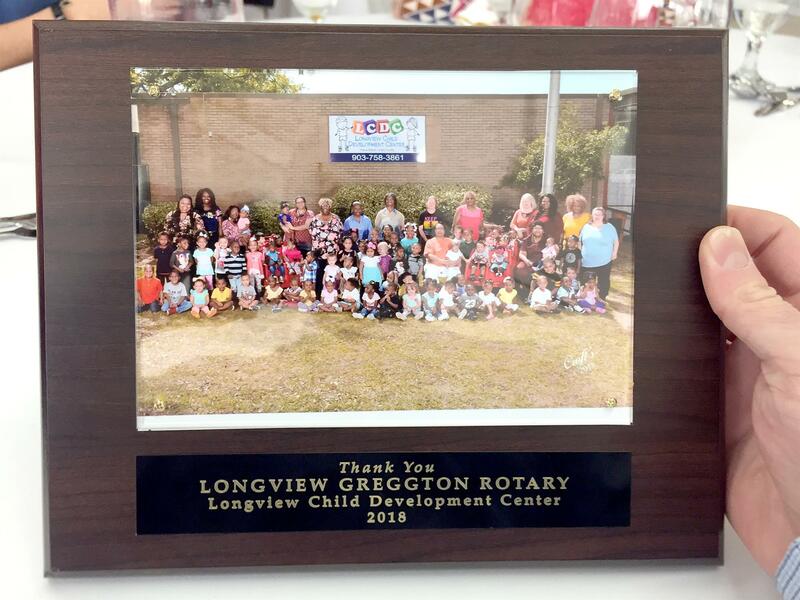 We had a great meeting last week at the Longview Child Development Center. Executive Director LaToyia Hawkins and crew had a great spread for us, and we got a chance to see the Learning Lab, which was set to open this week for parents and teachers there. Parents with children at the center must be working 30 hours or more per week, be enrolled in a job training program or be a full-time student. The lab will be available to help parents fulfill those requirements, including providing online learning opportunities. There’s a small (I thought I had more pull than that!) 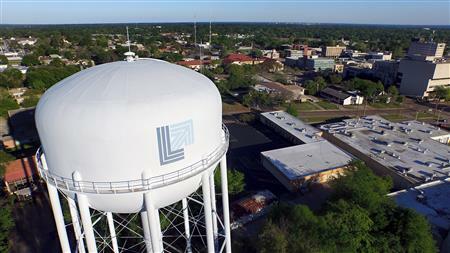 item in the Longview News-Journal today about the lab. Donna Koerner is looking for some folding chairs for our Christmas party Friday, Dec. 14, at the Tubbs’ home. If you have access to some folding chairs we could use, please contact her or me to let us know. I’ve had at least one other club member ask about times. If you’d like to help, you’re welcome to stop by. The more the merrier! Congratulations to club member Mary Ann Miller’s son, Brady who is one of ten Longview Lobos honored on the Texas High School Coaches Association’s Academic All-State Team released this week. Brady picked up first-team honors! It is Angela Daughtry’s week to lead us in the song, pledge, prayer and 4-Way Test, and it is Dionne Lott’s week to provide the prize for Rusty’s Raffle. We will have our annual business meeting on Friday, which should be relatively short. Then, we will hear live music from the Pine Tree choir. I hope everyone had a good Thanksgiving, spending time with family and friends. Reminder: We are not meeting at the church this week. We will be meeting at noon at Longview Child Development Center, 1230 S. High Street. It’s $10 for lunch, chicken-fried steak, and bring a children’s book to donate if you can. We’ll be seeing the computer lab funded by Longview PRCA Rodeo funds. If you have signed up to help with RYLA interviews, the ones that remain are Spring Hill ISD at 1 p.m. and Pine Tree ISD at 2:15 p.m.
Wednesday, Dec. 5: Rodeo meeting, noon, East Texas Builders Association. Friday, Dec. 7: Club meeting with live Christmas music. Saturday, Dec. 8: Salvation Army bell ringing at Gilmer Road Wal-Mart. Friday, Dec. 14: No club meeting. CHRISTMAS PARTY. Please RSVP to Donna Koerner if you haven’t. Click here to see the updated flier attached. I hope you’re all having a good Thanksgiving week. I’m sending this as a reminder that we will not be meeting this Friday. We will be meeting the following Friday (Nov. 30) at the Longview Child Development Center. They’re at 1230 S. High Street. If you didn’t sign the list that you plan to attend, please let me know so we can get them a fairly accurate head count. Lunch will be chicken-fried steak. It’s $10 and please feel free to bring a children’s book to donate. Monday, Nov. 26: Board meeting, noon, Development Services. Friday, Dec. 7: Annual business meeting at regularly scheduled club meeting with live Christmas music. 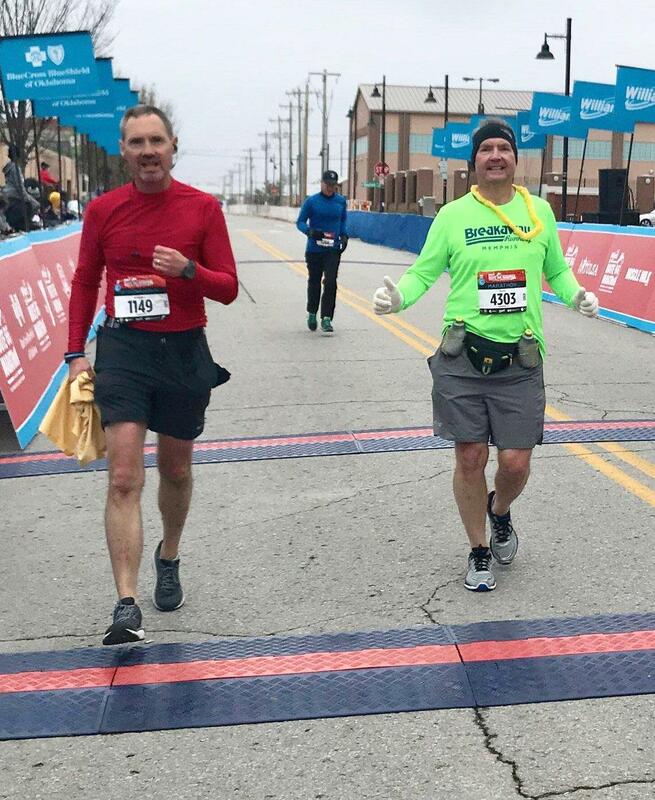 And a big congratulations to club members Mark and Vince Dulweber for completing their first full marathons this past Sunday. Way to go! Have a great Thanksgiving. I’ll see you next week at Longview Child Development Center. Hope everyone is staying warm. If you’re not, at least we’ll be in the 60s by Friday. That should help. If you missed last week’s meeting, you missed the induction of two new members. If you see Steve Clugston, left, next to Charles, or Eric Cedarstrom at a meeting, please introduce yourself and invite them to sit at your table. Great to have them! We also heard from Dr. Ben Mack about his mission work in Guatemala. Ten Rotarians – and one young helper – worked Saturday morning to do our part during the citywide Green & Clean. Thanks to those who were able to make it and brave the cold to do our part. If you’re looking for another service opportunity, check with Colt Edwards about ringing the bell for the Salvation Army on Saturday, Dec. 8 at the Gilmer Road Wal-Mart. Also, Mark Dulweber wanted to remind everyone that the Thanksgiving Food Drive is coming up, and that organizers there have a need for donations and volunteers. On Monday, Nov. 19th, three to six volunteers are needed to put together 1,300 boxes of food, and donations are welcome. The boxes will be handed out from noon to 3 p.m. on Tuesday, Nov. 20, and volunteers are welcome to come help. If you haven’t , please RSVP for the Club Christmas party. It’s Friday night, Dec. 14, at the home of Michael and Julia Tubb, and it’s sure to be a great time. For more details, check out the flier. Nov. 23: NO MEETING. Happy Thanksgiving. Nov. 27: Interact meeting at Pine Tree ExCEL High School. Nov. 30: Meet at Longview Child Development Center. $10 donation for chicken-fried steak. We’ll see the computer lab funded by the club. ALSO: Bring a children’s book if you can to donate to the center. Dec. 7: Annual business meeting at the church and live Christmas music by a choir at Pine Tree. Dec. 14: NO MEETING. Christmas Party at Michael and Julia Tubb’s home. Dec. 21: NO MEETING. Merry Christmas. This week, we’ll hear from the Gregg and Upshur County game wardens. It is ‘s week to lead us in the song, Pledge, prayer and 4-Way Test, and it’s Bob Little’s week to provide the prize for Rusty’s Raffle. The menu Friday is sliced ham, yam patties and turnip greens. I hope you're all having a good week. We have some important service opportunities coming up. (This) Saturday, Nov. 10: We have our street cleanup this Saturday during the citywide Green & Clean. Meet at 8 a.m. at the Pine Tree High School parking lot off Fairmont. The more Rotarians who show up, the faster it goes! Saturday, Dec. 8: We’ll be ringing the bell for Salvation Army at the Wal-Mart on Gilmer Road. We have fewer spots to fill. Check with Colt Edwards for open spaces. Friday, Dec. 14: Club Christmas party at Michael and Julia Tubb’s home. Check out the flier here. No meeting at the church on this day. If you've been thinking about making a donation to the Rotary Foundation, this is a good time to do it. November is Rotary Foundation Month. The Rotary Foundation recently received for the 11th consecutive year the highest rating — four stars — from Charity Navigator, an independent evaluator of charities in the U.S. It is Judge Charles’ week to lead us in the song, Pledge, prayer, and 4-Way Test, and it is Mike Lewis’ week to provide the prize for Rusty’s Raffle. The menu this week is beef tips with rice and mixed vegetables. At the meeting this week, we’ll hear from Dr. Ben Mack about his medical mission trip. We’ll also induct a couple of new members. Veterans Day is Sunday. Take some time this weekend to thank those who serve to protect and preserve our freedom. Veterans Day stems from the end of the of World War I, which was formally ended on the 11th hour of the 11th day of the 11th month in 2018. That’s 100 years ago this year. We heard an inspirational story from Walter Patterson last week. The man who contracted polio when he was 18 months old and still uses braces on his legs to get around was able to make it to the basecamp of Mount Everest. As inspiring as that is, with Rotary’s continued efforts to eradicate polio, it’s an obstacle one day soon no one will have to face. Saturday, Nov. 10: Street cleanup. Meet at 8 a.m. at Pine Tree High School parking lot off Fairmont. Saturday, Dec. 8: Ringing the Bell for Salvation Army at Wal-Mart on Gilmer Road. Colt Edwards will have the signup sheet at this week’s meeting. Friday, Nov. 30: Club meeting moved to Longview Child Development Center, 1230 S. High Street, for ribbon cutting on new computer lab funded with rodeo proceeds. $10 lunch. Chicken-fried steak. Friday, Dec. 14: Christmas Party at Michael and Julia Tubb’s house. No club meeting. This week, we will hear from Jennifer Martin of Shriners Hospital for Children in Shreveport. It was the world’s first Shriners hospital. The facility is a specialty hospital treating children with orthopaedic issues, cleft lip and palate and more. It is Scott Caron’s week to lead us in the song, Pledge, prayer and 4-Way Test, and it is Randall Latch’s week to provide the prize for Rusty’s Raffle. The menu this week is barbecue ribs, potato salad and baked beans. 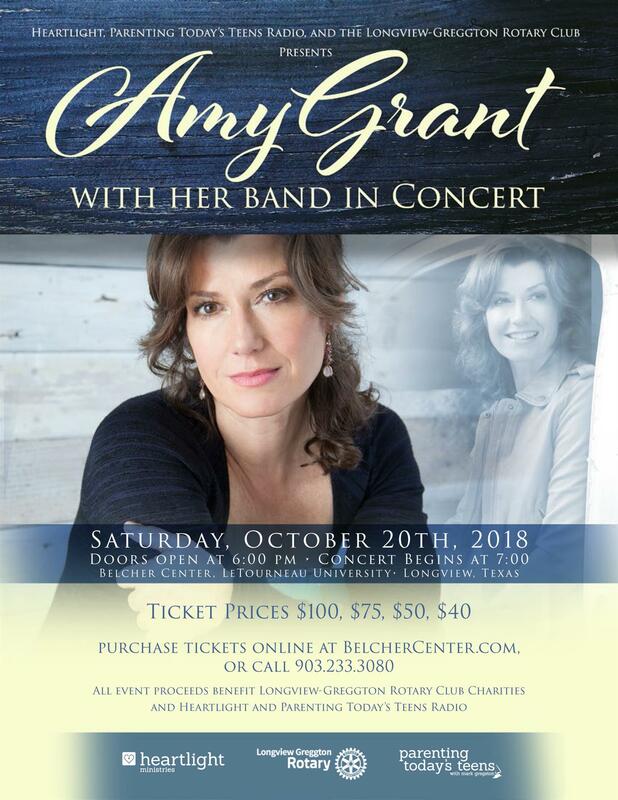 As I was standing in the lobby of the Belcher Center Saturday night, I heard a few comments about the long line of cars filled with people anxious to get into the parking lot for the Amy Grant concert. A big thanks to everyone, especially Roger Sage Jr. and Keith Bailey, for the hard work on the concert. Great show! It’s clear our club again brought quality entertainment to Longview in a way that will also help us help local organizaitons. Thanks to the club members who were also sponsors, as well. Ten of us in all, including a couple spouses, were at the District Concert Friday and/or Saturday at the Holiday Inn in Longview. It was a good turnout, and it was a lot of fun spending Friday night and much of Saturday with Rotarians from our club and others in District 5830. Sessions focused on membership, Rotary Club Central, club flexibility and focusing on the youth. Pastor Jeff asked me Saturday night what I took away from the conference that we could bring back to the club. I told him keynote speaker Greg Yank talked some about what we as club members get out of Rotary and what we want to get out of Rotary. Look for us to be asking that question in the future. Past President Ingrid Self passed along the sad news about longtime member Archie Tehan's passing. She sent a second email with information about services. Visitation will be tomorrow (Oct. 24) from 5 to 7 p.m. at Rader Funeral Home. 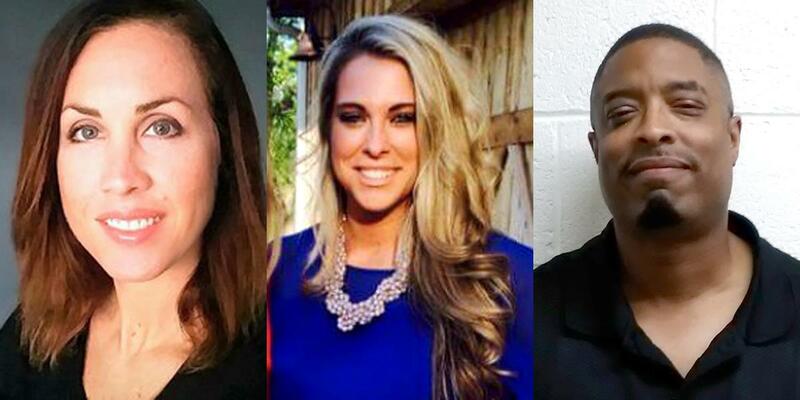 A Celebration of Life will be at 2 p.m. Thursday (Oct. 25) at Oakland Heights Baptist Church. He was a great man and is already missed. We will again be ringing the bell for the Salvation Army this year, although we’ve scaled back some. Our day is Dec. 8 at the Wal-Mart on Gilmer Road. We’ll be manning Door #1. We will have the signup sheet at the meeting this week. Be prepared to sign up for a shift, so we can get them all taken care of during the meeting. 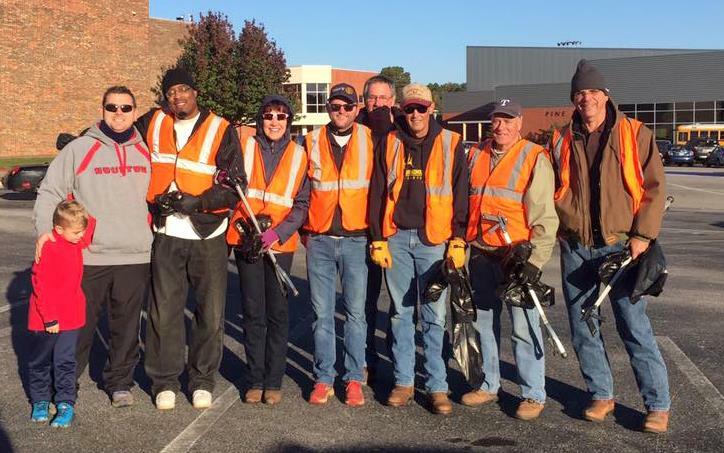 And here’s another service opportunity: Street Cleanup, Saturday Nov. 10, 8 a.m., Pine Tree High School parking lot. World Polio Day is Wednesday, Oct. 24. Our speaker this week is a man who contracted Polio at 18 months old. He’s overcome a lot in his life, including having trekked to the basecamp of Mt. Everest in 2008. We will be taking donations to PolioPlus during the meeting Friday, so please consider marking this occasion with a donation to help end Polio. It is Meghan Byrne’s week to lead us in the song, Pledge, prayer and 4-Way Test, and it’s Donna Koerner’s week to supply the prize for Rusty’s Raffle. The menu this week is shrimp etoufee with red beans. I’m sending this to remind everyone that we WILL NOT be meeting this week since we have the District Conference and the concert with Amy Grant Saturday. If you said during last week’s meeting that you’d be at the Belcher Center Saturday to help greet, please be sure to be there. Also, if you’re still thinking about registering for the District Conference, there’s time. I’ll be getting the check for our registrations from Laura tomorrow. And, don’t forget we’ll be doing our street cleanup on Saturday, Nov. 10, the same day as the citywide Green and Clean. Meet at 8 a.m. at the Pine Tree High parking lot off Fairmont. The more people we have show up, the faster it goes. Ingrid said she went by to check on Archie this week. She said he was sitting up and eating and that he looked great. Good news! We'll be back at the church on Friday, Oct. 26, with a presentation that coincides with the week of World Polio Day. 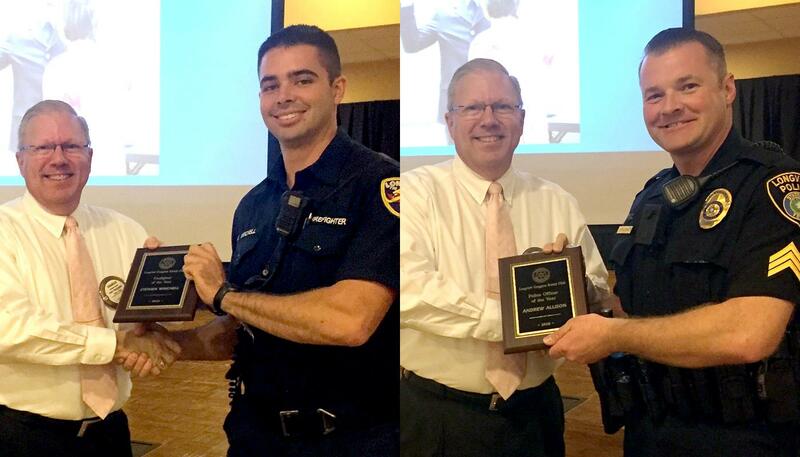 It was an honor for our club to be able to present plaques to the Police Officer (Andrew Allison) and Firefighter (Stephen Winchell) of the Year last week. Thanks to all who made that possible. Our Interact Club had a meeting Tuesday, and its numbers are growing. Tim Lewis sent me this photo, which shows a nice group. Our concert featuring Amy Grant is just around the bend. Be on the lookout for some volunteer needs for the night of Saturday, Oct. 20. That's the same weekend as the District Conference, which is Friday night and Saturday morning through afternoon. We're up to eight people registered to attend from our club. The club can pay for at least four more, and I'd like to hit that number. It is Gaylon Butler's week to lead us in the song/pledge/prayer and 4-Way Test, and it’s Steve Kattner’s week to provide the prize for Rusty’s Raffle. At this week’s meeting, we’ll hear from Chris Miller, executive director of the North East Texas Regional Mobility Authority. The menu this week is fried chicken, mashed potatoes and green beans. I appreciate everyone who was able to make it to the trial meeting at the Hilton this past week. I know there were many who simply couldn’t make it, but I’m glad we had such a great turnout. We’ll be talking with them more about what the Hilton can offer in terms of a long-term meeting location. For now, though, we are back at the church this week and beyond. 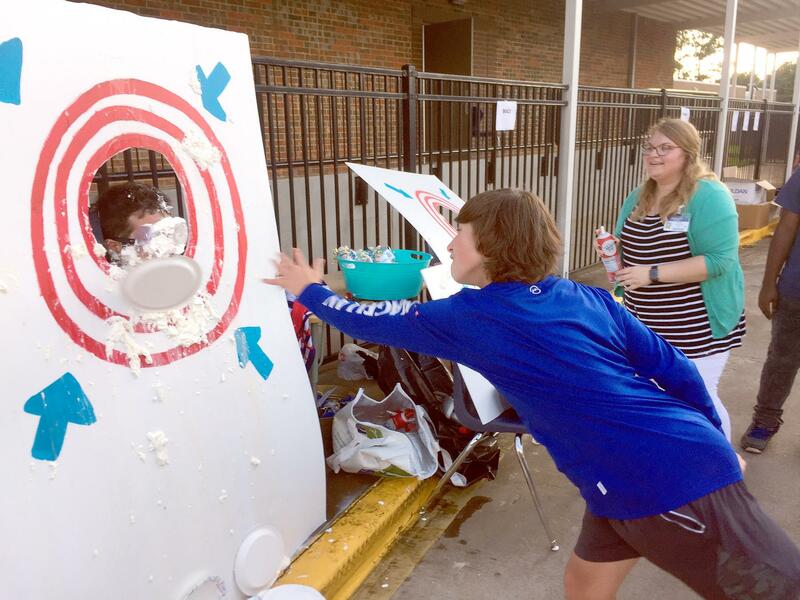 Our Interact Club at Pine Tree had a lot of fun Tuesday during the district’s homecoming carnival, which coincided with National Night Out. 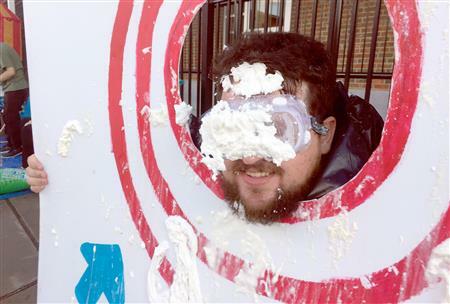 If you haven’t seen the photos on Facebook, the students were taking tickets to let visitors throw a pie into the face of a teacher or administrator. I was there for a while, and those teachers were covered! Remember, we have a big Rotary weekend coming with the Amy Grant concert fundraiser and the District Conference. We have five people from the club registered for the District Conference at this point. I’d like to have at least 10 from our club there. The club can pay for several more registration fees, all you have to do it show up. Find the registration form here. And we will not have a regular club meeting the Friday (Oct. 19) of that weekend. 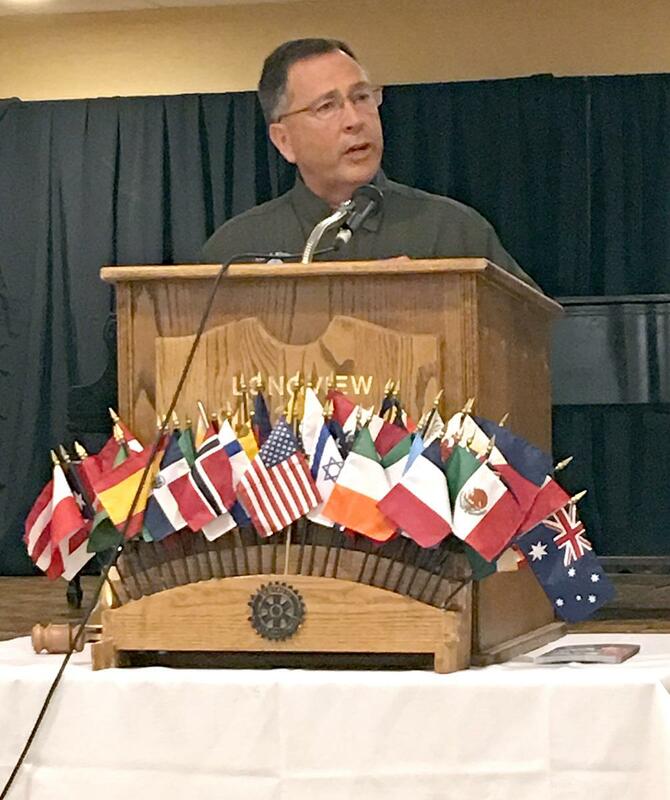 At this Friday’s meeting, we will learn about the Rotary Exchange program, which is something the club hasn’t been involved with since I’ve been a member. It is Russ Brown’s week to lead us in the song, pledge, prayer and 4-Way Test, and it’s Jack Jenkins’ week to provide the prize for Rusty’s Raffle. The menu this week is spaghetti with meatballs, garlic bread and Caesar salad. I hope everyone is having a good week. REMEMBER: We are NOT meeting at the church this week. We will be having our trial meeting at the Hilton Garden Inn on Hawkins Parkway. We will be in the Pinehurst A room, which is the side closer to the windows. If you walk in the main doors, go toward the hallway to the left past the restaurant/bar area. Feel free to call me if you’re unsure where you’re headed. We had a productive and encouraging Interact meeting yesterday. There were five students. We’re hoping to grow on that. The five that were there are interested, and Rotarians Meghan Byrne, Colt Edwards and Tim Lewis have helped them get some plans in place for activities and to attract more members. There was a work day scheduled today to get items prepared for an Interact booth at Pine Tree’s Homecoming Carnival next week. The students were excited to be working on that. Donna Koerner will be making the Chicks N Chaps $5,000 check presentation Saturday morning to Texas Oncology. The presentation will be made prior to the Celebrate Life Survivors 5K Run, and we’d love for some club members to be present. She says the presentation is at 8:30 a.m. The survivors lap is scheduled for 8 a.m.
Our fundraising concert featuring Amy Grant is coming up quickly on Oct. 20. Watch your inbox soon for information about how you can volunteer to help that day. That is the same weekend as the District 5830 Conference at the Holiday Inn here in Longview. It is Friday and Saturday. I’ve mentioned this a couple of times in email and during our meetings. If you have any interest and can go, please consider attending, even if it is for only part of it. The breakout sessions Saturday morning and service project Saturday after lunch will be a great experience. The district has really been helping get the word out about our concert, and I'd like us to support them in return. Our club can pay the registration for several of you. Please see me if interested! Remember, we will not have a club meeting Oct. 19 because of the concert and district conference. It is Pastor Jeff’s week to lead us in the song, pledge, prayer and 4-Way test, and it is David Hayes’ week to provide the prize for Rusty’s Raffle. I don’t know the menu this week. The food will be prepared by the Hilton’s Ronald Porter, so I expect it to be good. I know some club members are out of town. I'm hopeful we'll have a good group for Laura Hill's presentation about the city's 150th birthday celebration and to get some responses about what people think of the Hilton as a possible new meeting space for the club. Let’s get on the board, Orange team. I mentioned during last week’s meeting that we’d had an encouraging increase at last week’s meeting of the Interact Club. Tim Lewis has been working on reinvigorating the club. To help with that, we’d like to get some Rotarians at the next meeting. It will be at 4 p.m. on this coming Tuesday, Sept. 25, in room 706 of the Pine Tree ExCEL building. Remember, the District Conference is Oct. 19 and 20. It’s the same weekend as our fundraising concert featuring Amy Grant. I’d like to have a good showing from our club at the conference since it’s here in Longview. Let me know if you can make it. At Friday’s meeting, we’ll hear from Judge Alfonso Charles. He’ll be speaking about the U.S. Constitution. It is Pastor Russ Brown’s week to lead us in the song/pledge/prayer and 4-Way Test, and it’s John Harris’ week to provide the prize for Rusty’s Raffle. The menu this week is baked chicken, roasted potatoes and Brussels sprouts. It’s hard to believe it’s been 17 years since terrorists used planes to attack our nation on our soil. 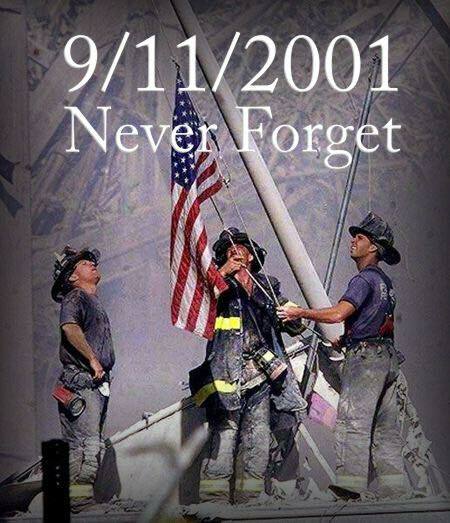 I’m sure many of us took time to remember that day and thank God for the first responders and others who work so hard to protect us day in and day out. I know I did. Club Secretary Donna Sharp sent the Week 1 winners of our Cowboys football pot to the club on Tuesday. Congratulations to Randy Harris, J.P. Steelman, Colt Edwards and Karen Maines! Van Patterson will be leaving our club soon as he has taken a new position as a vice president at Galveston College. It's sad to see him leave the club and the community, but I wish him all the best. Please do the same. Our concert fundraiser featuring Amy Grant is getting closer all the time. Saturday, Oct. 20 will be here before we know it. Remember, tickets to the concert are available at BelcherCenter.com. That also means the District Conference is getting closer. I’d like to have a lot of members of our club in attendance that weekend since it’s right here in Longview at the Infinity Events Center at Holiday Inn. The club can pay for several people to register. Please come see me if interested. 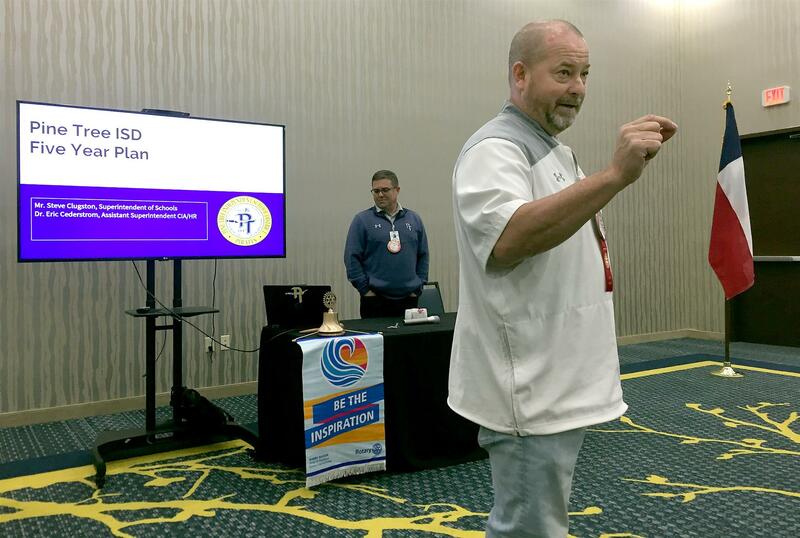 Past District Governor Ted Huffhines would like us all to check out this promo video about the conference that was sent this week to District 5830 club presidents. There’s a plug for our concert at about 1:02. We are finishing up an agreement to have our Sept. 28 meeting at the Hilton Garden Inn as a trail run to see if it might be a good fit for future club meetings. This is similar to the one we did before at Pinecrest Country Club. I’ll be sure to remind everyone as that is set. This week, we’ll be hearing from Dan Riegstad of the Kilgore College Police Academy. It is Keith Bonds' week to lead us in the song, pledge, prayer and 4-Way Test, and it is Merritt Grimm's week to bring the prize for Rusty's Raffle. The menu Friday is fried catfish, pinto beans and cole slaw. I hope everyone had a great Labor Day weekend and that the much-needed rain didn’t dampen your plans. We had a good group Friday of those who were able to make it to GZ’s for lunch. Thanks, Ingrid, for organizing that. 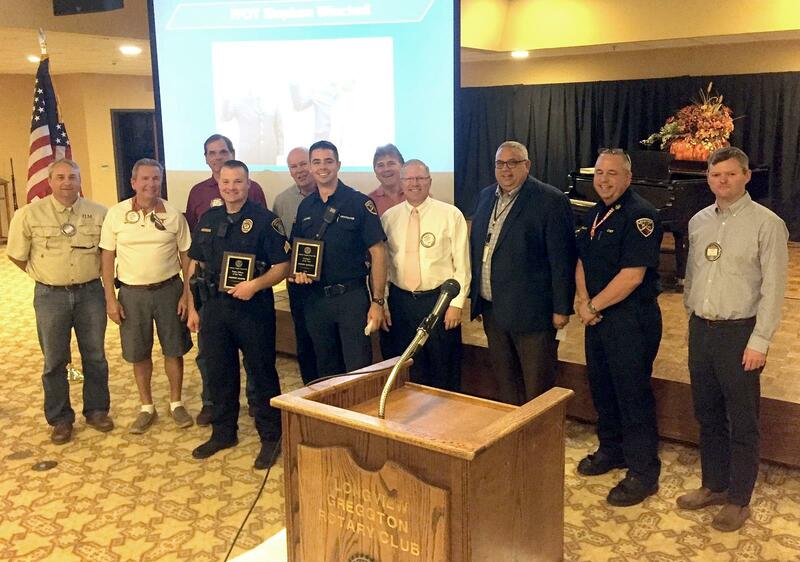 Our club got a little recognition in the most recent Rotary District 5830 newsletter. The item was about our recent check presentations for funds raised at the Longview PRCA Rodeo in April. It’s nice to get some recognition at the district level. 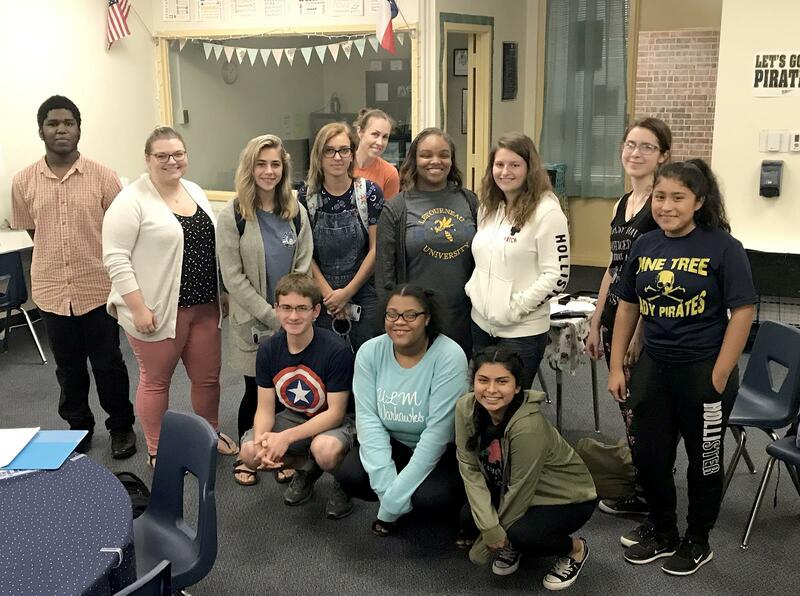 This past week, Tim Lewis met with our Interact officers and the sponsor at Pine Tree ExCEL High School. Our numbers are few to begin the school year, so the focus is on spreading the word and attracting some new young people to join. Remember: Tickets are on sale for our upcoming concert fundraiser featuring Amy Grant. We’re hoping it sells out. So, get yours early, if you are planning to go. Don’t forget to be looking for opportunities to sell a sponsorship. That’s money the club keeps and gets to put back into the community. 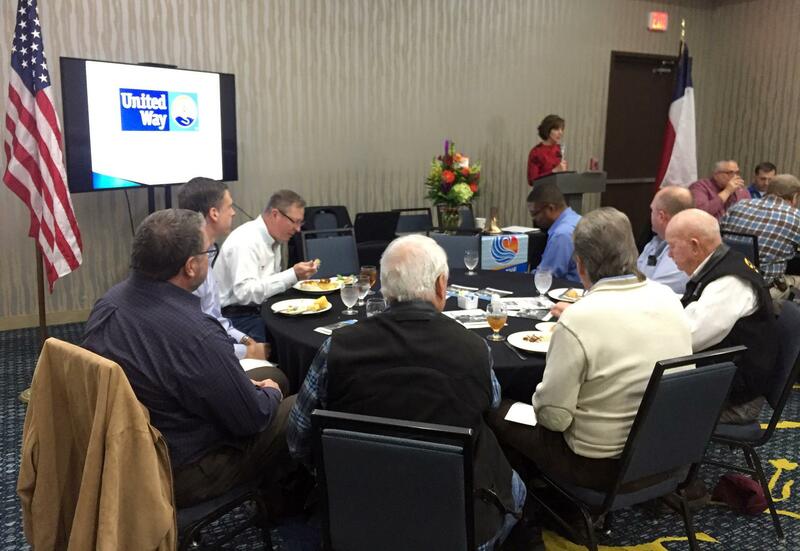 At this week’s meeting, we’ll hear from KLTV Program Manager Pat Stacey as our program. It is Mike Bishop’s week to lead us in the song/pledge/prayer and 4-Way Test, and it is John Green’s week to bring the prize for Rusty’s Raffle. The menu for Friday is sliced ham, black-eyed peas and sweet potato patties. See you there. 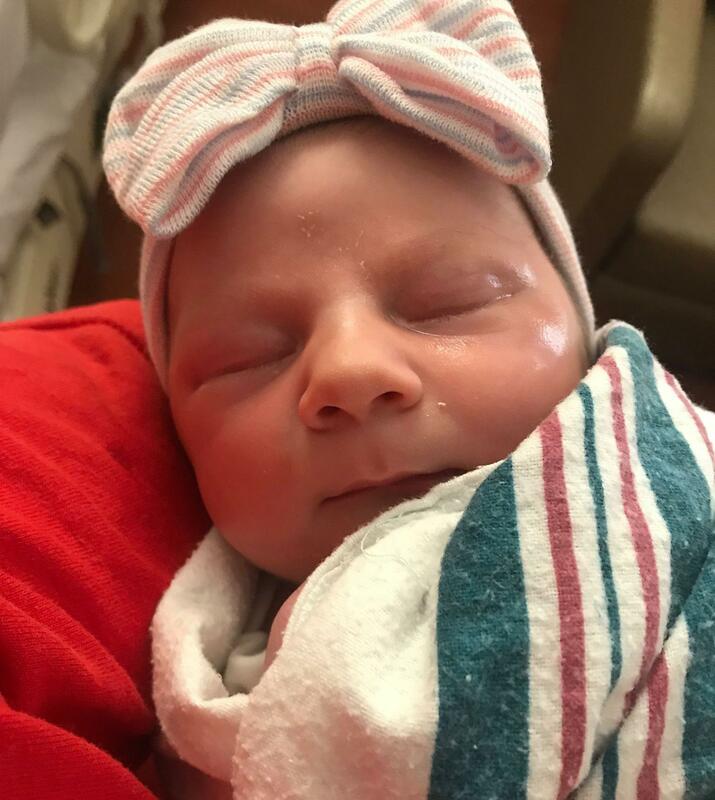 Congratulations Edwards family on the addition, and welcome to the world, Poppy! State Rep. Jay Dean visited the club this past Friday and talked about a number of issues. He touched on education, the opioid crisis and the race to become the next speaker of the Texas House. Jay said he thought the person who will ultimately become speaker might not even have filed to run at this point. It will be interesting to watch. Thanks to Scott Forbes and David Yowell for their work on the Cowboys pot. All of the squares are sold! Remember, we will not be meeting at the church this week. If you’re able to make the social lunch Friday, please RSVP with Ingrid. Otherwise, have a great Labor Day weekend, and I’ll see you next week. If you weren’t at the meeting last week, you missed a fun one. Not only did we induct three new members into the club, but we also got to hear an interesting program from club member Daniel Wiebracht about dressing intentionally. Our new club members are, from left, Meghan Byrne, Amber Campbell and Troy Murrain. Meghan Byrne lives in Longview and is a strong supporter of the revitalization of South Longview. Meghan is a commercial Realtor with Sperry Commercial Global Affiliates – Graham Group. She specializes in multi-family properties. Amber Campbell is 26. She was born and raised in Jefferson, Texas. She moved to Hallsville when she was 15 and now lives in Longview. Amber attended UT Tyler, where she earned a degree in elementary education. Amber is currently working at Regions Bank and has been in banking for four years. Troy Murrain is a Community Employment Specialist for The Arc of Gregg County Employment Services. Troy assists individuals with disabilities in finding and maintaining employment in their communities. Tickets are on sale now for our fundraiser concert with Amy Grant on Oct. 20 at the Belcher Center, and we need to keep selling sponsorships. At Friday's meeting, we'll hear from cardiologist Dr. Samir Germanwala. CHANGE OF PLANS: We'll be hearing from club member State Rep. Jay Dean this week about the opioid crisis, Hurricane Harvey and the upcoming session. It is Casey Beddingfield's week to lead us in the song/pledge/prayer and 4-Way Test, and it's Scott Forbes' week to provide the prize for Rusty's Raffle. The menu this week is meatloaf with mashed potatoes and peas and carrots. We had a great conversation with the head football coaches from Longview, Pine Tree and Spring Hill. That's always a fun meeting. Tickets are on sale now for our upcoming fundraiser concert with Amy Grant. Get them here. Don’t forget that we still need sponsors! Roger and Keith have set a goal of $75,000 in sponsors, and we need your help to get there. I know we can do it. We are still working to fill up the squares on the Cowboys pot. Foundation Chair David Yowell said last week that we’re doing better than we have in years past. Let’s keep that momentum. Rotary International has named August as Membership and New Club Development Month. 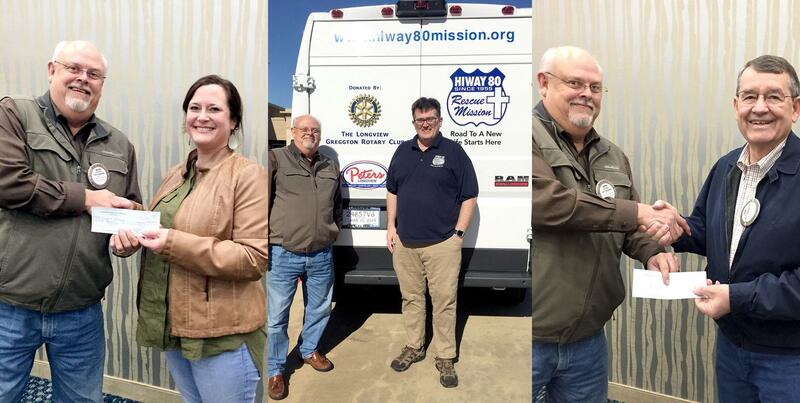 In that spirit, Membership Chair Martha Griffin is working on a way for us to offer a little incentive for bringing an guest who might become a Longview-Greggton Rotarian. Start thinking about who you might invite. It is Richard Emerson’s week to provide the prize for Rusty’s Raffle, and it’s Jim Bartlett’s week to round up club members to lead us in the song, pledge prayer and 4-Way test. The menu this week is barbecue ribs, baked beans and potato salad. 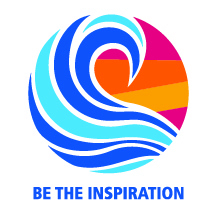 It’s another great week to Be the Inspiration. I meant to take a picture of the crowd at last week's meeting and forgot. We had a lot of people there at one of my favorite recurring meetings of the year — when we hear from the nonprofits who benefit from funds raised at the rodeo. At this year's rodeo, Karen and her team emphasized four reasons to consider visiting the rodeo. Three of them (it's a fun night for the whole family; there are children's activities after the show; and it's an annual Longview tradition) are evident while we're working those nights. The fourth (All proceeds support the community) we got to see during last week's meeting. And we're already actively involved in getting sponsorships for our concert fundraiser, which is quickly headed our way. 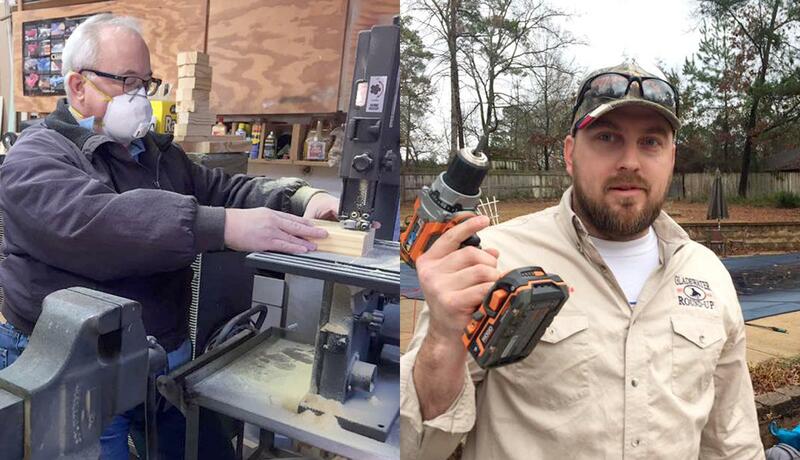 Keith Bailey and Roger Sage Jr. have been working hard to get us to about $43,000 in sponsorships. That's great, but the goal is to reach $75,000. YOU CAN HELP! If you bought a sponsorship in the past, please consider doing so again. If you know someone who might, get them the sponsor form Keith sent to club members or download it here. And as Keith wrote, be sure to make plans to come to the event and enjoy a great evening of music. This week, we'll hear from our local high school football coaches. We're expecting coach King from Longview, coach Lane from Pine Tree and coach Mercer from Spring Hill. This is always a good one. News-Journal sports editor Jack Stallard will also join us. It is Vince Dulweber's week to provide the prize for Rust's Raffle. It is Doug Barnard's week to lead us in the song, pledge, prayer and 4-Way Test. The menu this week is expanded salad bar, but I haven't told our coaches that. It was great to have Christus Good Shepherd Health System CEO Todd Hancock at our club last Friday to get an idea of what’s happening with the health system and what changes the system has seen since Christus took it over. The meeting is a chance to see how our hard work truly translates into giving back to the community. It is Julio Arriola's week to help lead us in the song/pledge/prayer and 4-Way Test. It is Mark Dulweber’s week to provide the prize for Rusty’s Raffle. Bob Little recently had surgery. Please keep him in your thoughts and prayers. I talked to his wife, Carol, today. She said he's improving in Dallas and that they hope he's headed home soon. When our Club Visioning team met during this past Rotary Year, one of the areas of discussion was about our Foundation giving. A goal for the club this year is to work toward become a 100 percent Paul Harris Fellow club, and we're not very far off! Foundation Direction David Yowell is working on a plan that will help us do that. Watch for details once that gets worked out. The menu this week is beef tips and rice with green beans. 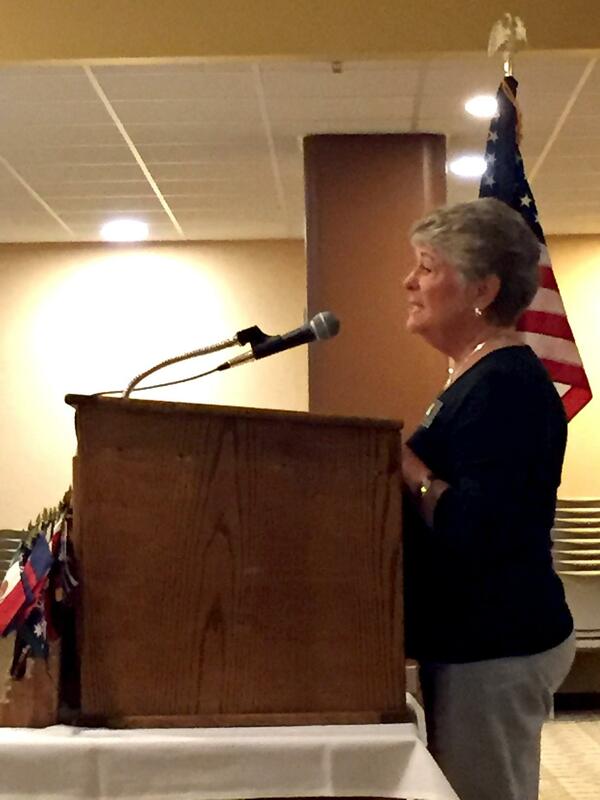 We had a great group at our meeting last week when we had a chance to hear from District Governor Judy Guthrie. She talked about some of the ways Rotary is changing and told us of some of Rotary International President Barry Rassin’s goals for the year. We’ll be hearing this Friday from Christus Good Shepherd Health System CEO Todd Hancock. He has to leave a few minutes early, so expect us to adjourn the meeting a little before 1 p.m. this week. It is Dave Wright’s week to lead us in the song, pledge, prayer and 4-Way Test, and it is Rep. Jay Dean’s week to provide the prize for Rusty’s Raffle. On the menu this week is chicken fried steak, mashed potatoes and green beans. Aug. 3: We’ll be handing out checks to nonprofits benefiting from funds raised at our Rodeo. We will not have a meeting on Aug. 31 ahead of the Labor Day holiday. 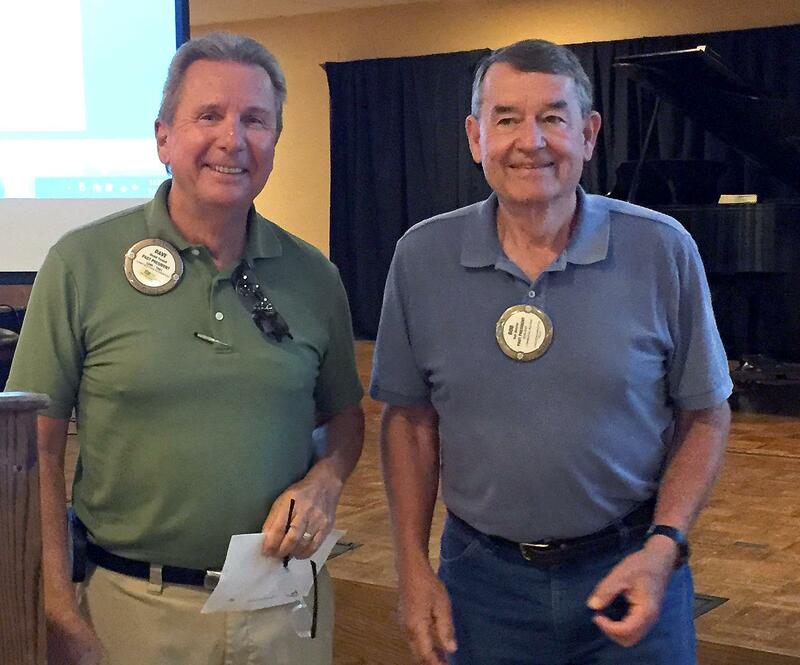 If you missed this past week's meeting, then you didn't get a chance to see club member Bob Metzler receive his Paul Harris +7 recognition by Foundation Director David Yowell. Congratulations, Bob! That's quite an accomplishment. 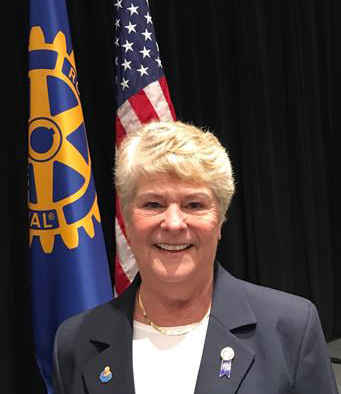 At this Friday's meeting, we will hear from District 5830 District Governor Judy Guthrie of the Rotary Club of Carthage. If you see her, please say hi. Here's a photo to the right. It is Daniel Wiebracht's week to be in charge of the song, pledge, prayer and 4-Way test. It's Angela Daughtry's week to provide the prize for Rusty's Raffle. On the menu this week is tacos and refried beans. I hope everyone had a great Fourth of July. Thank you to all of those were able to make it to our social meeting last week at Butcher Shop. It was a fun way to start the year, and Randy Harris brought some nice table tents we can likely reuse for club events. Here’s a photo he shot during the lunch. We're back at the church this week. During our program, we’ll hear from Erik Duerkop, manager of the Caddo Lake National Wildlife Refuge. It is Tommy Warren’s week to be in charge of the song, pledge, prayer and 4-Way Test. It’s Alfonso Charles’ week to supply the prize for Rusty’s Raffle. On the menu this week is hamburger buffet with potato salad and beans. I'll probably write and talk about this several times during the year: If you haven't downloaded the Clubrunner app, you should! 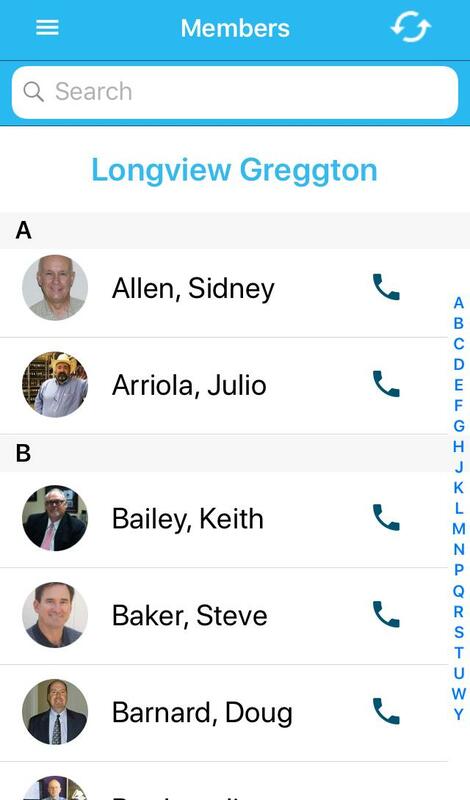 Once you download it, you can use your Clubrunner login info, and it will bring up a handy club directory right on your phone, complete with one-click dialing for club members. It's great if you're not sure if you have added someone's contact. Welcome to the new Rotary year, everyone! I’m looking forward to a great year. We already have exciting stuff on the horizon with the recent announcement about the October concert fundraiser in partnership with Heartlight Ministries. Look for more information soon about how you can help make this as successful as our previous years’ concerts. A big thanks to Ingrid and Stephen Self for opening their home to host the party Saturday celebrating the close of Ingrid’s excellent year as president! One thing that will be challenging and fun this year will be to start implementing some of the recommendations made by the Visioning team that was created after our larger Visioning meeting with District 5830 representatives. The idea is to keep our club on a path that will get us to where the group said we want to be in three years. We won’t be meeting at the church this week. We’ll instead have a social meeting at the Butcher Shop with some time for fellowship. Stop on by at our normal time, order your lunch and join us in the back room at the restaurant. Bring some thoughts about what you would like to see the club accomplish this year. Butcher Shop doesn't officially reserve the room; however, the manager said we are welcome to bring our own reserved labels and push tables together however we like. I’ll be showing up early to help make sure we’re set. Have a safe and happy Independence Day, and I hope to see you Friday for lunch at Butcher Shop. Need an online make-up? Here's how. If you missed a recent meeting and need a quick make-up, check out the Rotary eClub One site, and choose one at the top right.